Arsenal fans should not overreact after their team’s north London derby defeat, according to Gary Neville, who expects this season to be a "blip" in the club's timeline. The Gunners fell to a 2-0 defeat at White Hart Lane on Sunday, with Mauricio Pochettino’s men confirming that they will finish above their bitter rivals for the first time since Arsene Wenger took over as Arsenal manager. The club are sixth in the Premier League, six points behind fourth-place Manchester City, though they do have a game in hand. Neville, though, insists that the club’s progression to the FA Cup final – they will face league leaders Chelsea at Wembley after defeating Manchester City in the last four – means that their league “blip” must be forgiven. "If they won the FA Cup this year, would that be seen as a successful season? I'd say probably yes,” Neville said on his podcast. "People will argue their league performance has been the worst it's been for 15-20 years but maybe they are allowed a blip." 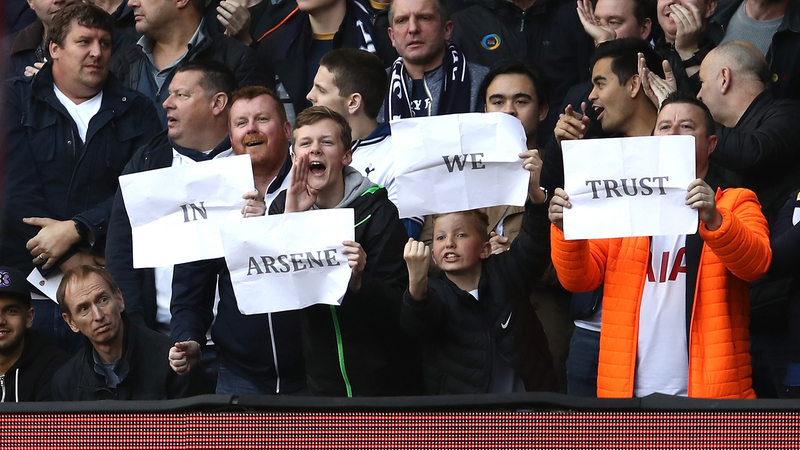 Protests have marred Arsenal’s season thus far, with several supporters calling for Wenger’s resignation. However, Neville does not believe that the Frenchman’s position has changed, and says that he may well continue at the helm next season. “I don’t think it leaves Wenger in a different position,” he added. "There won't be a straw that breaks the camel's back with Arsene Wenger. It's a more the long term principle of whether the board and the manager feel it's the right time - and no-one knows the answer to that. We'll just have to wait and see - it is a unique situation where a manager has been there for so long. "The board have got an incredible amount of loyalty to him and rightly so. The manager seems to be in a strong position, where he can almost dictate when he finishes. Everyone wants an answer today but I can't see that happening while the FA Cup and league campaigns are still going on."